Programmatic advertising offers publishers the opportunity to present more relevant ads to users from a wider variety of advertisers who are paired with publishers through the elements of ad exchanges. The flipside is that publishers’ websites have to track users for their many advertisers and this has an impact on site load times and usability. The growing challenge for publishers is managing the unfortunate side effects of the shift to a programmatic advertising environment where visitors must be tracked across multiple websites to be able to present them with relevant ads. I’ll explore some of the thinking behind ad tracking, the resistance to it and the light at the end of the tunnel for publishers. Why Track Visitors to Your Site? For publishers that have embraced programmatic advertising, this is a rhetorical question. You have to track visitors, not only to your site but to and from other websites. Tracking readers tells you more about them and the information you glean from that helps you present them with more relevant (in other words: useful) ads and content. Publishers have to present ads to visitors to their sites. Those ads should be relevant to those visitors. One of the unfortunate expectations the prevalence of free apps and content has given rise to is the expectation that everything should be free. Unfortunately this is usually not feasible. Content costs money to produce, good content costs even more. Costs may include what you pay your writers; hosting fees to host and manage your website and a variety of other hidden costs that make it possible to publish your content on your website and tell your readers about it. Those costs have to be recovered somehow and a common revenue model is display advertising. Traditional display advertising uses fairly crude targeting techniques in an attempt to present relevant ads to visitors to a website. The reason why you want to present relevant ads is that relevant ads are more engaging. Consider whether you are more likely to click on an ad about something you have no interest in whatsoever or an ad about something you are interested in? The challenge is predicting which ads are more likely to be relevant to your visitors than not? The answer is programmatic advertising which offers advertisers and publishers an opportunity to show increasingly relevant ads to visitors based on a variety of hints about their interests and intentions. The key to achieving this level of personalization is learning more about visitors to your website and, short of them volunteering information, a powerful method for achieving this is tracking their activity across your site and, more importantly, across the many sites they visit. This is where things become somewhat tricky. Tracking people online means using one or more technologies. One of the better known options is a website cookie which is typically added to a person’s browser when he or she visits a website. These cookies are then sent back to advertisers that use the data collected by the cookies to map a person’s journey online and draw inferences about the person’s interests based on that data. For example; if a person visits a series of car-related websites then its probably reasonable to infer that the person is interested in buying a car and ads promoting car deals would be useful. If an ad is useful, it is more likely to be clicked and that, in turn, could lead to a sale which is usually the ultimate goal of advertising. Jarvis’ view isn’t the popular view, though. Popular opinion is that this sort of tracking is bad because these cookies can transmit a considerable about of information about the people they track back to advertisers, which is a privacy concern. This isn’t a new theme and it will continue to be a significant factor in the online advertising mix for some time still as personal information use is increasingly regulated by legislators and industry bodies. Much of this increased regulation is built on a wave of popular concern about the privacy implications of online display advertising. It is a Catch–22 for the most part: consumers who accept that “free” content and services must be paid for by advertising revenue expect ads that are, at the very least, relevant and useful and, at the same time, they don’t want to surrender personal information to inform that level of personalization. Fortunately, there are tracking technologies which are not as invasive and I’ll tell you more about them a little later in this article. Leaving aside the privacy implications of ad tracking, there is a practical challenge for publishers. A clear illustration of this challenge is a recent controversy about the popular tech website iMore. Popular privacy concerns and the increased load on websites are likely driving companies like Apple to develop more integrated ad and content blocking technologies that targets the code that powers ads. Apple’s upcoming iOS 9, for example, enables the sort of content blocking that Murphy developed for his experiment and this capability is integrated into the iOS Safari browser which is either the most popular or second most popular mobile browser (depending on whose statistics you trust). Embedding content blocking this deeply into devices will make it almost trivial for users to block ads. Another challenge is Facebook’s Live Articles which offer advertisers a powerful platform to target their ads very precisely, based on the detailed personal information and explicit signals Facebook users send just by using the service. You probably noticed that I wrote that Facebook’s Live Articles offers advertisers a powerful platform even though Live Articles is notionally meant for publishers, like you. The thing is; advertisers remain the primary focus of Facebook’s offering because it is their ad revenue that will make publishing your content natively on Facebook instead of your own website so attractive. Short of developing a revenue model that leaves you less dependent on ad revenue to keep the lights on, you have to create an environment that best serves your advertisers or join them where all the action is. If anything this puts Facebook’s Instant Articles initiative in a far more positive light: the social network is offering to not only improve the user experience by displaying articles instantly — thanks, primarily, to the lack of programmatic advertising cruft — but also to help monetize said content by selling ads against it and sharing 70%, backed by profile data that is far superior to even the ad networks. 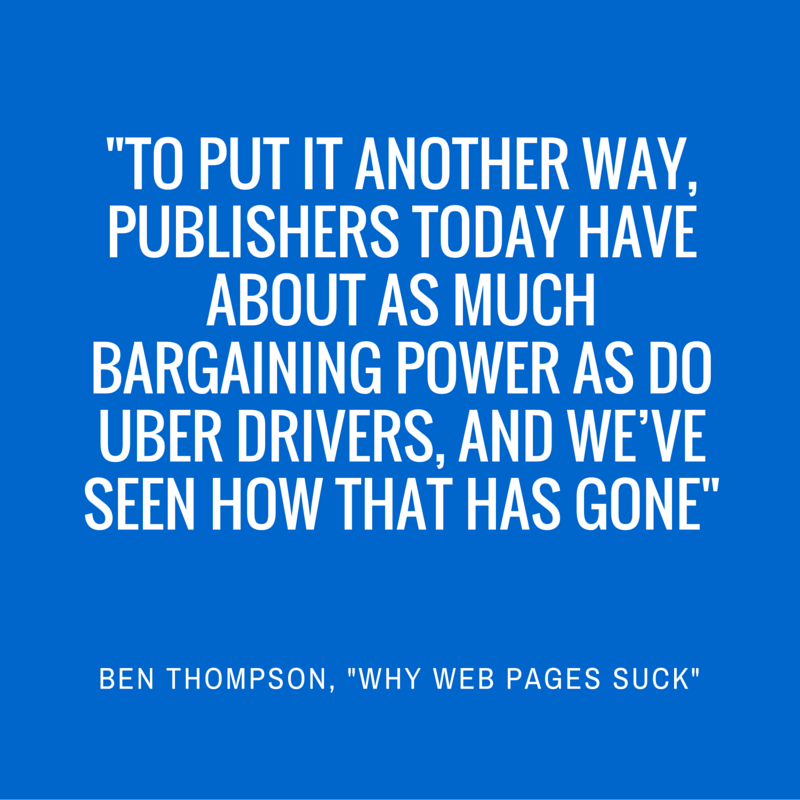 Unfortunately this puts publishers in a difficult position. It means weighing up the benefits of entrusting your value, namely the content you publish and that draws the crowd, with a powerful 3rd party platform provider like Facebook (and taking the risk that the crowd won’t feel the need to return if you change your mind later) or finding a compelling alternative that also appeals to your advertisers enough to retain them too. While we sell premium ads directly to advertisers, that only fills a small subset of the required “inventory” to support the network. Some 85% of ads we served last month were “programmatic”—provided by ad exchanges like Google Adx and Appnexus. Those exchanges are pretty much black boxes. We get a tag, we insert it, and ads appear. Fortunately there are new, promising technologies which offer alternatives to tracking tools that seem to be so invasive from a privacy perspective. Why is this significant? Simple: if you can deploy tracking technologies that are not perceived to be a direct and massive threat to users’ privacy, they may be less inclined to use ad blocking tools and allow you to present relevant ads and pay the bills to keep more great content coming. When it comes to privacy the key concern is how much personally identifiable information is obtained from users and passed on to advertisers and other stakeholders? What if the information obtained was virtually anonymous? Advertisers don’t need to know that Joe Smith (with an email address joesmith@gmail.com and phone number +1 555 123 4567), a 37 year old male living in Florida, is interested in super-bikes and has a passion for old action figures. Advertisers could still present relevant and compelling ads if they simply know that a male between the ages of 35 and 40, living in Florida is interested in super-bikes and action figures. If the tracking technology removes the need for personally identifiable information and publishers are transparent about precisely what data is used and for what purpose, it may stem the data bleed. Another factor that supports a move away from the current cookie model is that cookies are not effective cross-device tracking technologies and this means that consumers who switch between desktops and mobile devices can’t be meaningfully tracked. Even less so with people who primarily use mobile devices that don’t support cookies. The market is really moving towards the unique device Identifier for Advertising (IDFA) or device fingerprinting solution as the answer to tracking in a non-cookie-compliant world. Additionally, the thinking across mobile and platforms needs to shift towards a user-based attribution model. 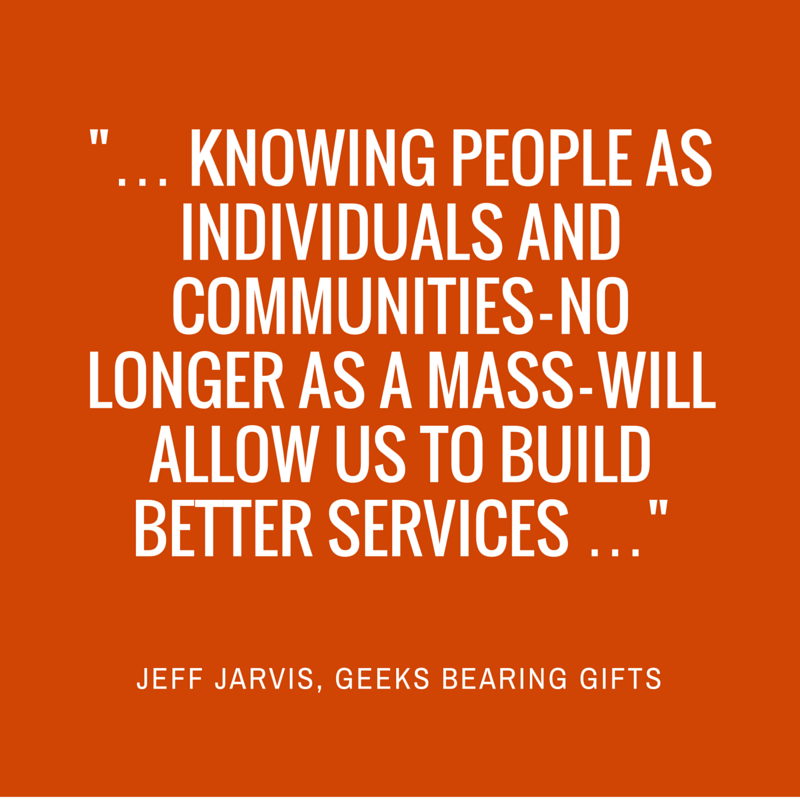 “People-based marketing” (i.e. user-based attribution) is when each user is attributed to their source and what they do in the app. This blend of technologies allows attribution with greater accuracy. Other options for improving visitors’ experience of your websites include optimizing the code that powers your website and removing legacy cruft that slows down visitors’ experiences unnecessarily. What is becoming clear is that publishers have to make changes to preempt a massive adoption of ad blocking tools and forcing them into an even tighter spot. This means optimizing code; exploring less invasive ad tracking technologies and keep producing great content that your visitors expect.